When winter comes, Hedgie tries to stay awake so he doesn't miss out on all the fun his friends are having. Snow is on the way, and as Hedgie trundles around the farm all his friends tell him of the winter-time fun he will miss as he hibernates--Icicles decorating the chicken coop! Lisa making snowmen! The pond turned to slippery ice! It sounds so amazing, Hedgie decides to stay awake instead of going to his burrow. But then a snowstorm starts. Luckily, Lisa finds him and brings him inside so Hedgie gets to see the wonders of winter from inside the cozy house. 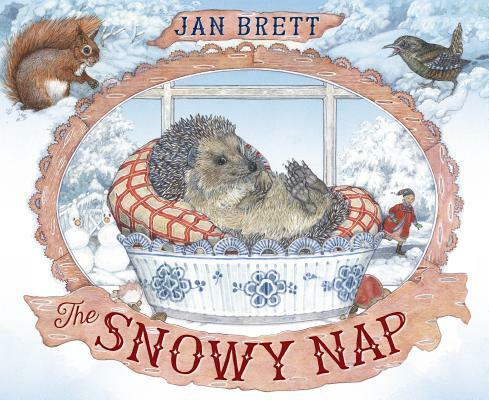 With more than 34 million books in print, Jan Brett is one of the nation's foremost illustrators of children's books. As a child, she decided to be an illustrator and spent much of her time reading and drawing. As a student at the Boston Museum School, Jan spent many hours in the Museum of Fine Arts. Travel is also a constant inspiration, so with her husband, Joe Hearne, who is a member of the Boston Symphony Orchestra, she visits many different countries where she researches the architecture and costumes that appear in her work. Jan lives in a seacoast town in Massachusetts.